Are you preparing for your first triathlon? Do you want to improve your times this year? My First Triathlon Workshop is for you! – what other equipment do I need? – how to recover fast? Basic Induvidaulised Training Plan For ALL the Participants is INCLUDED! 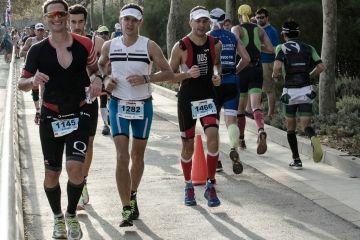 The workshop is led by Leszek Stelmachowski, Ironman Coach. 🏊‍♂️Open water swimming techniques, sighting, turning, fitting and removing wetsuit etc. 🚴‍♂️ Preparing your bike, bike rules and regs, bike position, bike equipment and nutrition on the bike leg. 🏃‍♂️ An efficient run technique, warm up and post exercise stretching, running drills. TRANSITION: Kit layout, transition set-up, options to save time, applicable rules.